Matt Moderwell dribbles the ball. The junior midfielder scored his second goal of the season against Rutgers. It seemed all too familiar for Northwestern. With a little over two minutes remaining in regulation, the Wildcats looked primed to head into its third straight overtime, knotted up at 1 against Rutgers. Then the game took an unexpected turn. Scarlet Knights’ forward Brendan Wall, who scored the first goal of the game, passed to the ball to his teammate, defender Thomas Devizio from inside the 18-yard box. Devizio took a one-timer from inside the box and it deflected off the hand of graduate defender John Moderwell. Initially, there was no call by the referees, but the assistant referee called a handball and awarded Rutgers a penalty kick. Against the Big Ten’s leading scorer Jordan Hall, sophomore goalie Miha Miskovic made a diving attempt to the right side to save the goal. Even though Miskovic got a hand on the ball, the shot was simply too fast and the Scarlet Knights took the lead on Hall’s 10th goal of the season, adding to his assist earlier in the game. In an important game for NU (4-6-4, 0-4-2 Big Ten) for seeding in the Big Ten Tournament, Rutgers (3-9-1, 2-4-0) got the last laugh and is very close to locking up a 7-seed in the tournament, which is crucial in avoiding a 8th-seed vs. 9th seed play-in game. After taking 17 shots in each of their previous two games, the Cats came out with more of the same on Friday. In the first half, NU constantly put pressure on the Scarlet Knights’ defense, but couldn’t come up with any finishes. The Cats took eight shots in the first half, including a shot from freshman midfielder Connor McCabe that hit the post and a shot from freshman midfielder Bardia Kimiavi that was blocked. Rutgers’ goalkeeper Rafael Pereira made four saves in the first half to keep the game scoreless. After Rutgers scored its first goal, NU responded quickly with a goal of its own. 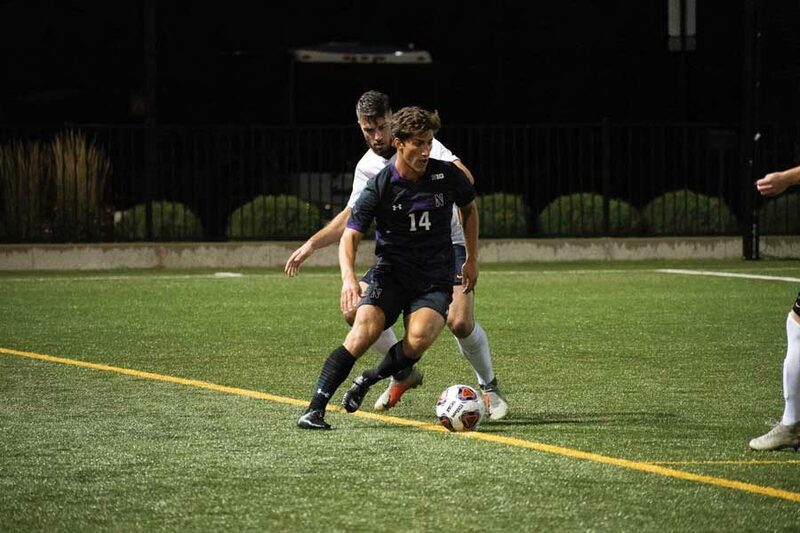 Sophomore midfielder Tommy Katsiyiannis dribbled the ball to the end line, before passing it back to junior midfielder Matt Moderwell, who came streaking into the box and scored past the outstretched arms of Pereira. For the younger Moderwell brother, that marked his second goal of the season. By the end of the game, the Cats had outshot the Scarlet Knights 16-14 and had controlled possession for most of the game, but they simply didn’t turn their chances into goals. Even with the recent stellar offensive play, NU is still looking for the signature win to break its 8-match winless streak. “That loss really stung the other night,” Lenahan said. “Not just how it happened, but I thought we were primed for an exceptional performance and we only had an average performance.